Editor’s Note: The Grace Hopper Celebration of Women in Computing is coming up, and Diane Greene and Dr. Fei-Fei Li—two of our senior leaders—are getting ready. Sometimes Diane and Fei-Fei commute to the office together, and this time we happened to be along to capture the ride. Diane took over the music for the commute, and with Aretha Franklin’s “Respect” in the background, she and Fei-Fei chatted about the conference, their careers in tech, motherhood, and amplifying female voices everywhere. Hop in the backseat for Diane and Fei-Fei’s ride to work. Fei-Fei: Are you getting excited for Grace Hopper? Diane: I’m super excited for the conference. We’re bringing together technical women to surface a lot of things that haven’t been talked about as openly in the past. Fei-Fei: You’ve had a long career in tech. What makes this point in time different from the early days when you entered this field? Diane: I got a degree in engineering in 1976 (ed note: Fei-Fei jumped in to remind Diane that this was the year she was born!). Computers were so exciting, and I learned to program. When I went to grad school to study computer science in 1985, there was actually a fair number of women at UC Berkeley. I’d say we had at least 30 percent women, which is way better than today. It was a new, undefined field. And whenever there’s a new industry or technology, it’s wide open for everyone because nothing’s been established. 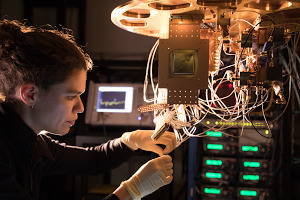 Tech was that way, so it was quite natural for women to work in artificial intelligence and theory, and even in systems, networking, and hardware architecture. I came from mechanical engineering and the oil industry where I was the only woman. Tech was full of women then, but now less than 15 percent of women are in tech. Fei-Fei: So do you think it’s too late? Diane: I don’t think it’s too late. Girls in grade school and high school are coding. And certainly in colleges the focus on engineering is really strong, and the numbers are growing again. Fei-Fei: You’re giving a talk at Grace Hopper—how will you talk to them about what distinguishes your career? Diane: It’s wonderful that we’re both giving talks! Growing up, I loved building things so it was natural for me to go into engineering. I want to encourage other women to start with what you’re interested in and what makes you excited. If you love building things, focus on that, and the career success will come. I’ve been so unbelievably lucky in my career, but it’s a proof point that you can end up having quite a good career while doing what you’re interested in. Fei-Fei: And you are a mother of two grown, beautiful children. How did you prioritize them while balancing career? Diane: When I was at VMware, I had the “go home for dinner” rule. When we founded the company, I was pregnant and none of the other founders had kids. But we were able to build a the culture around families—every time someone had a kid we gave them a VMware diaper bag. Whenever my kids were having a school play or parent teacher conference, I would make a big show of leaving in the middle of the day so everyone would know they could do that too. And at Google, I encourage both men and women on my team to find that balance. Fei-Fei: It’s so important for your message to get across because young women today are thinking about their goals and what they want to build for the world, but also for themselves and their families. And there are so many women and people of color doing great work, how do we lift up their work? How do we get their voices heard? This is something I think about all the time, the voice of women and underrepresented communities in AI. Diane: This is about educating people—not just women—to surface the accomplishments of everybody and make sure there’s no unconscious bias going on. I think Grace Hopper is a phenomenal tool for this, and there are things that I incorporate into my work day to prevent that unconscious bias: pausing to make sure the right people were included in a meeting, and that no one has been overlooked. And encouraging everyone in that meeting to participate so that all voices are heard. Fei-Fei: Grace Hopper could be a great platform to share best practices for how to address these issues. Diane: Every company is struggling to address diversity and there’s a school of thought that says having three or more people from one minority group makes all the difference in the world—I see it on boards. Whenever we have three or more women, the whole dynamic changes. Do you see that in your research group at all? 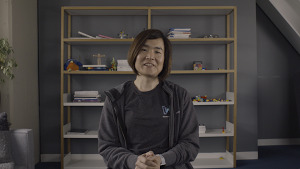 Fei-Fei: Yes, for a long time I was the only woman faculty member in the Stanford AI lab, but now it has attracted a lot of women who do very well because there’s a community. And that’s wonderful for me, and for the group. Now back to you … you’ve had such a successful career, and I think a lot of women would love to know what keeps you going every day. Diane: When you wake up in the morning, be excited about what’s ahead for the day. And if you’re not excited, ask yourself if it’s time for a change. Right now the Cloud is at the center of massive change in our world, and I’m lucky to have a front row seat to how it’s happening and what’s possible with it. We’re creating the next generation of technologies that are going to help people do things that we didn’t even know were possible, particularly in the AI/ML area. It’s exciting to be in the middle of the transformation of our world and the fast pace at which it’s happening. Fei-Fei: Coming to Google Cloud, the most rewarding part is seeing how this is helping people go through that transformation and making a difference. And it’s at such a scale that it’s unthinkable on almost any other platform. Diane: Cloud is making it easier for companies to work together and for people to work across boundaries together, and I love that. I’ve always found when you can collaborate across more boundaries you can get a lot more done. To hear more from Fei-Fei and Diane, tune into Grace Hopper’s live stream on October 4.